Sundara Nagari .. City of Destiny .. the great city of Visakhapatnam that has earned many names. Visakha, who won the top two for the first two years of pure survey awards. The Vizag residents are particularly vulnerable to keeping the city on top of the purview of the people when they play a key role. The Central Government has been awarded awards to the respective cities across the country. The city has been selected for the awards for infrastructure, sanitation management, public extermination, house construction, transportation systems, garbage management, etc. The competition is in the midst of over 500 towns and cities. Visakhapatnam, which finished fifth in 2016, reached third in 2017. Earlier this year, the response from the public was unreasonable. 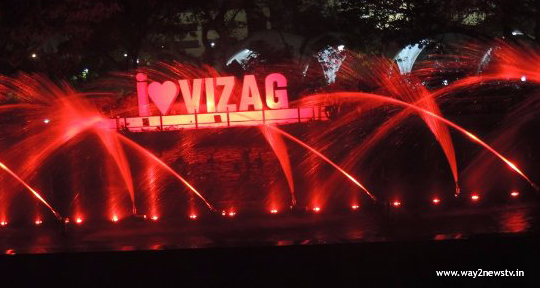 But the people of the city responded to the campaign under the guidance of GVMC Commissioner Harinarayanan with Love Vizag slogan. The response in the feedback section of the key people in the rank is amazing. According to official estimates, 72,100 Vizag people have been feeded by Thursday. Current estimates show that the Greater Visakhapatnam feeds are at a high altitude. In this section, 12,106 people in Vijayawada, 17,425 in Tirupati, 15,549 in Rajahmundry and 10,012 in Kakinada. The happiness of the Greater Indians has been doubled for seven times by the Visakha residents. The Citizen Feeds will have 35% marks (1400 marks) in these rankings. 4,000 marks can be acquired through the use of Pure App. Now in both the divisions GVMCC is climbing. GVMC is planning to bring about the consciousness of the people. 15 lakh bulk SMSs are requested by the city residents to alert and respond. Similarly, video messages are sent to some mobile phones and describes the priority of a pure survey. In addition, information is provided by 1969 toll free number or through a pure survey website or a pure purse. People are responding and sharing their opinions.